"Cats like to chew green things. for your kitty to chew on." If you suspect that your cat or kitten has ingested any plants poisonous to cats or other toxic substances, you must act immediately. Call your veterinarian or local emergency animal clinic right away. If you suspect your pet may have ingested any potentially poisonous substance and you cannot get a hold of your veterinarian or other local emergency pet service, in North America, you can call the ASPCA's Animal Poison Control Center at 1-888-4ANIHELP (1-888-426-4435). They are available 24/7. The Animal Poison Control Center is a non-profit organization without funding, so they will charge you $65 (USD) on a major credit card (MasterCard, Visa, American Express or Discover) to help them run this critical 24-hour service. If you're taking your cat or kitten to the veterinarian, it's best to take a sample of the plant or other poisonous substance along with you so the vet will know exactly what your kitty has ingested and they can treat him or her accordingly. 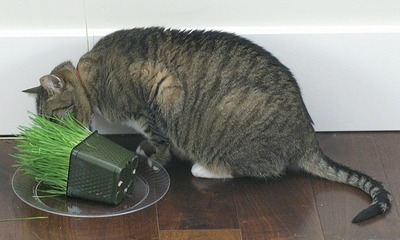 Most kitties love to chew on greenery, and often the only greenery to be found indoors is your houseplants. Unfortunately, many common indoor plants are plants poisonous to cats. Some are even fatal to our animal companions. If you have houseplants in your home, be sure they are safe and not toxic to your kitty. The safest bet for you and your cat is to not keep plants poisonous to cats indoors where your pets may eat them. See the list of plants poisonous to cats below. Even "safe, non-poisonous" plants can be poisonous to your pet. Most greenery found at nurseries, supermarkets or other stores are sprayed with insecticides. Some insecticide ingredients can make otherwise safe plants become plants poisonous to cats. These can cause serious neurological damage and even death to your feline or other pets. Even a small nibble on a plant sprayed with insecticides can make your kitty violently ill.
You can protect your cat or kitten by knowing the origin of the "safe" plants you bring into your home. Don't hesitate to ask the nursery what insecticides they use on their plants, and then research the insecticide used to make sure it's not toxic to pets. Let's say you've found some non-poisonous, insecticide-free houseplants. You probably still don't want your cat to chew on these, even if she finds them particularly tasty. One solution to prevent your cat from chewing your houseplants is to regularly spray diluted lemon juice on the leaves. Most cats hate this taste and will leave your leaves alone. Do not make the mistake of spraying plants poisonous to cats with diluted lemon juice and thinking they won't eat the plant. You should only use the diluted lemon juice on plants you have determined are safe, not on plants poisonous to cats. While the lemon juice can be a deterrent, it's not a guarantee. The best solution to keeping your kitty safe is by keeping plants poisonous to cat out of your home entirely. Giving your cat or kitten her own "plant" to chew is another solution. It also is actually beneficial for your cat's digestion and helps her get rid of unwanted matter, such as hairballs. Many pet supply stores and even grocery stores now sell cat grass. Catnip, sage, thyme and parsley are also safe for your cat to chew in moderate amounts. Wheat (not "wheat grass") and oat-grass sprouts are also safe and tasty for your feline companion. Ordinary lawn grass should be avoided, as it has razor-sharp spines that can cut your cat's mouth and even harm her digestive tract; it also may have been sprayed with unsafe insecticides. Your cat may vomit a greenish liquid with some plant fragments after eating a safe plant, such as cat grass. Don't worry. This is normal, as long it isn't excessive or constant. You can even grow plants specifically for your cat's enjoyment. If you choose to grow your own cat grass, catnip, sage, thyme, parsley or other safe "plants," be sure to use sterilized potting soil and untreated seeds. You should not use soil from your outdoor garden. If you grow catnip, it's probably best to grow this in a room inaccessible to your cat. You can give your feline companion a generous handful of fresh or dried leaves every week or two. Catnip has a powerful (yet, safe) chemical (Nepetalactone) that most cats love. Organic catnip is the healthiest. About two-thirds of all cats are mad about catnip; it's a genetic preference, so your cat may or may not be wild about it. After a deep whiff, your cat will dance, leap, prance, tumble and purr in ecstasy. And there is no need to worry about a catnip addiction. Catnip is completely safe. But if you give catnip to your cat too often, it may lose its appeal over time. Catnip - Effects on your kitty and how it works. Common Cat Health Problems - Other common cat health problems you need to know about. Here's a list of plants poisonous to cats based on the ASPCA Toxic Plants list. Visit their site for more details about each of these plants. They include photos and more info about each entry. The ASPCA also lists the plants not toxic to cats. Personally, I gave up on indoor plants years ago. I just didn't want to take the risk! Remember, you can visit the ASPCA's site for more info on each of these plants poisonous to cats.